B2C Lead Generation and Customer Growth Consulting. Rely on our 25+ years of marketing success helping large to medium sized b-to-c clients generate over 2.75 billion dollars in revenue using proven online and offline lead generation and customer growth strategies..
Our approach helps us create successful campaigns to meet our clients’ goals. Check out some of our great clients below. Use an integrated digital and direct approach for lead generation. Evaluate and improve your inbound marketing and direct marketing lead generation results. 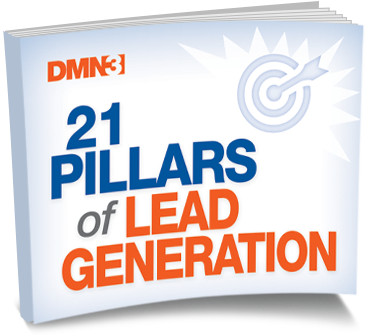 As a certified Inbound Marketer, DMN3 brings insights around online lead-generation techniques, content creation and conversion. DMN3 is MECLABS email marketing certified and a former ExactTarget (now Salesforce Marketing Cloud) reseller. Combining this with direct response experience, clients see a boost in email conversions. DMN3 has won awards for both creativity and response from the American Marketing Association, Web Marketing Association and Direct Marketing Association.